The thing that is most appealing to me about this take on strawberry shortcake other than the addition of rhubarb is that I leave it for my guests to assemble. 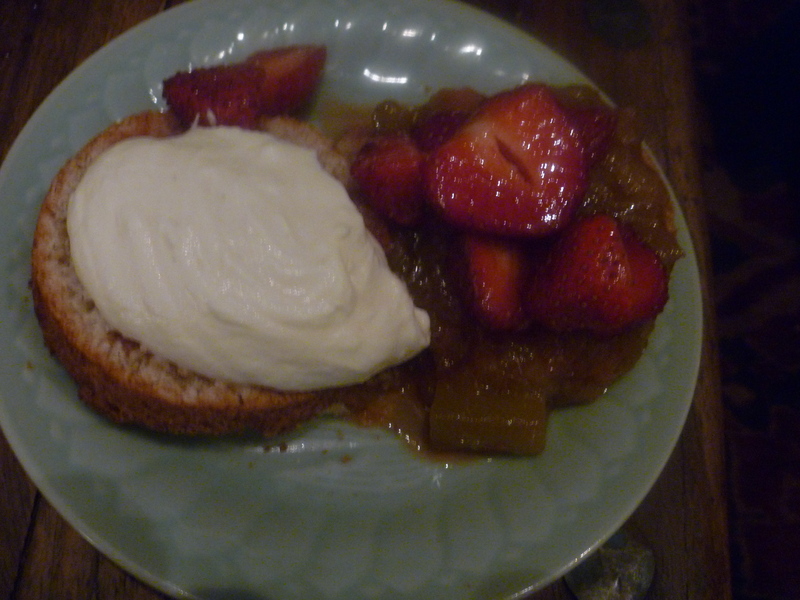 As hard as it may be to believe some people I know don’t like rhubarb (Neil) some people may prefer to just have rhubarb and at the end of the night if you have left over berries or rhubarb you can use them for any number of other uses, like breakfast with a dollop greek yogurt. The Oat biscuits are a further riff on the idea of got from Niki Segnit’s The Flavor Thesaurus that I mention in my crumble post. Having made them a couple of time now I almost thing they are too big for one dessert and instead of making only 6 that I would make 12 so that they would end up being just discs of biscuits that everything could be put on top of. Ruins the look of a hat on top of the dessert but as you can see from the picture below these are very crumbly biscuits that don’t always behave in the way you’d like them to. Again feel free to play around and adjust this recipe to your liking. In particular if you can’t find Quark you can always add sour cream or greek yogurt or just make simple whipped cream – or if you are feeling adventurous make some ice cream (I’ll leave the flavor up to you, I tried strawberry and Vanilla and I think I prefer the Vanilla). Generously butter large (3 1/2″) muffin tins either 6 or 12 depending on how thick you want your biscuits – the ones shown were made in a 6 muffin pan. In a large bowl add: 1 cup all-purpose flour, 1 cup plus 1 Tablespoon of Rolled Oats, 1/2 teaspoon Salt, 1 Tablespoon of Baking Powder and 1/4 cup sugar. Using your hands or a pastry cutter add: 5 Tablespoons of unsalted Butter stopping when the butter is mixed enough to be incorporated, but that there are still small lumps of butter throughout the mixture. All at once add: 5 Tablespoons of Heavy Cream and 7 Tablespoons of Half and Half. With a spatula just bring the mixture together. Divide the mixture into the prepared muffin tins. With a pastry brush coat eat muffin with a little heavy cream, then sprinkle 1 Teaspoon of Sugar over each one and top with a few rolled oats. Pop into the oven and cook about 20 minutes, the biscuits should be nicely browned. When they are done remove from the oven and cool on a rack. After about 10 minutes run a knife around each muffin to loosen and turn out onto a plate. To prepare the strawberries, remove green tops and slice in half or more if large. Place in a medium size bowl, for a quart of berries I use about 1/4 cup of Sugar and an optional squirt of lemon juice (like half a lemon), let sit in the refrigerator for about an hour before serving. Trim and chop into 2″ pieces 2 pounds of Rhubarb. Place into a medium-sized heavy bottomed pot and add 1 cup of sugar and 1/4 cup of water over medium heat. Stirring frequently as the fruit breaks down. After the 10 minute point you can add an optional 1/3 cup finely chopped crystalized ginger if you fancy. The stewed rhubarb should have nice thick texture, so cook it until the water has been cooked off and you are left with a thick bubbling mass. It should not be runny. In a medium bowl add: 2/3 cups of heavy cream and whisk or beat until it starts to hold its shape, then add: 1/4 cup of Quark (sour cream, greek yogurt or nothing) and continue to whisk, this will thicken the cream considerably, if it’s too thick add more cream, if not thick enough continue to whisk. Add a 1/2 teaspoon of vanilla extract and maybe 1 Tablespoon of sugar or to taste (I like it sour so…I’d use less). Just before serving, if you made the bigger biscuits, cut them in half horizontally and place on a plate. If you are trying the skinny biscuits I would just place all the components out on a table and let people assemble themselves with the biscuit on bottom, then rhubarb then berries and finally the whipped cream. If you want to get all Martha Stewart you could reserve (6-12) of the most perfect smaller berries, leave whole, rinse and place on the top (this of course only works if you prepare them for your guests). I think the stewed rhubarb really makes this dish and transform something familiar – strawberry shortcake – and makes it fresh and new – and of course the oat biscuits really send it out of the ballpark. At least that’s what I think. Leave a comment and let me know how yours turns out. 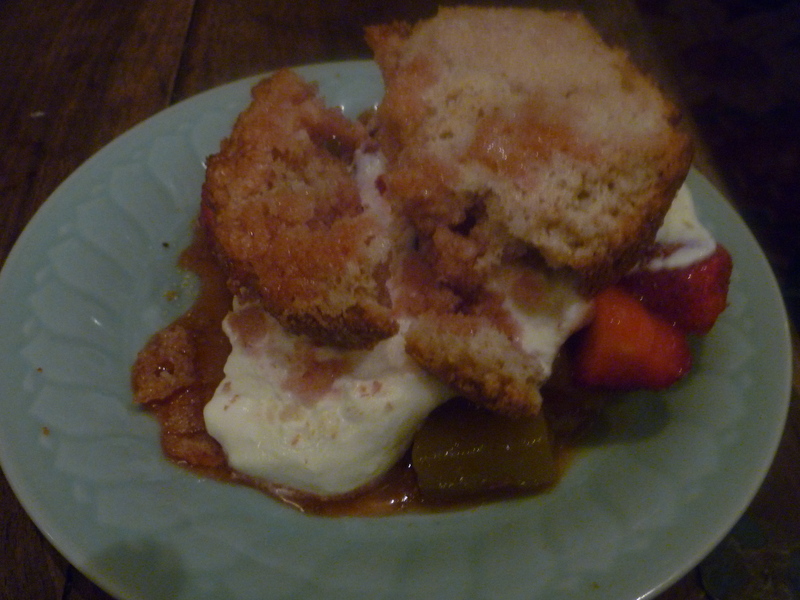 This entry was posted in Recipes and tagged Baking, Dessert, oat biscuits, quark whipped cream, Stewed ginger rhubarb, Strawberries. Bookmark the permalink.